These words always seemed a bit mystical and useless to me – Christians argued over them, and New Agers smoked over them. I wasn’t interested in either. In August when I left my prior job and the ministry I’d been involved with for almost a decade, the most profound thing happened at my goodbye party. It both released me and freed me not just physically, but spiritually. My boss listed all of the different hats and roles that I had worn and served in over the years, and then released me back to be only “Katie the Pure”. Not Katie the Costumer, Katie the Counselor, Katie the Administrator, Katie the Event Planner or Youth Leader. Just Katie the Pure. My name by definition means “pure, or pure one”. Destiny: the predetermined, usually inevitable or irresistible, course of events. Destination: the place to which a person or thing travels or is sent. Predestined: to destine in advance; foreordain; predetermine. In life I frequently mix up my destiny with my destination. My destiny was predestined when I said “yes” to Jesus, and when He chose me at the cross. 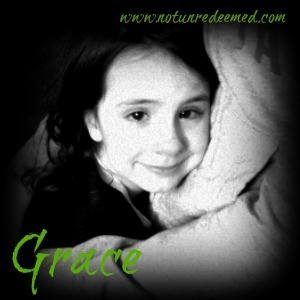 I became a child of God, a pure daughter of the King. My destiny is to be a daughter. 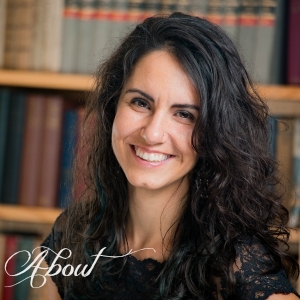 My destinations have included the roles of working as an Administrator, or an Event Planner. But they aren’t my destiny, just destinations along the way as I walk out my destiny as a daughter. Life will travel on, and I’m sure there are many more hats I will wear and roles I will gladly fill. Destinations will be traveled through or camped at for years, but the one thing that will always remain constant is my destiny. Over the years I’ve been pretty disappointed at relationships that didn’t end as I would have hoped, or destinations that tarried years beyond what I would have wanted – but I’m thankful. In that stripping, in the waiting, and in the frustration the Lord in His profound love purified the destinations that warred to steal the place in my heart that was for my destiny as His alone. In waiting for redemption it’s all too easy to miss out on knowing our Redeemer, and in pursuing our callings and destinations, its all too easy to mix up our destiny. Friend, destinations are incredible adventures! 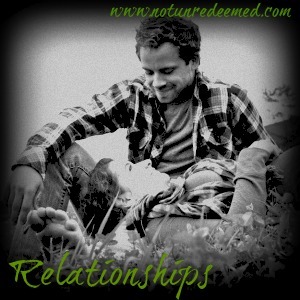 And redemption of broken dreams is a reality in the Kingdom of God! But don’t pursue them over knowing your Redeemer, or understanding your destiny as a son or daughter of God. Knowing your Redeemer and your destiny makes the destination so much sweeter. What’s your current destination? Where are you traveling to or being sent? Is it to be the best Mom you can be? Student? Husband? Accountant? Musician? Are you sent to the coffee shop? Or to the church? Maybe you are putting in job applications. Wherever you go today, whatever relationship you answer too, whatever you do – know that what you do, is not who you are. You are first a Daughter, first a Son. Your Father is lavishing love on you. 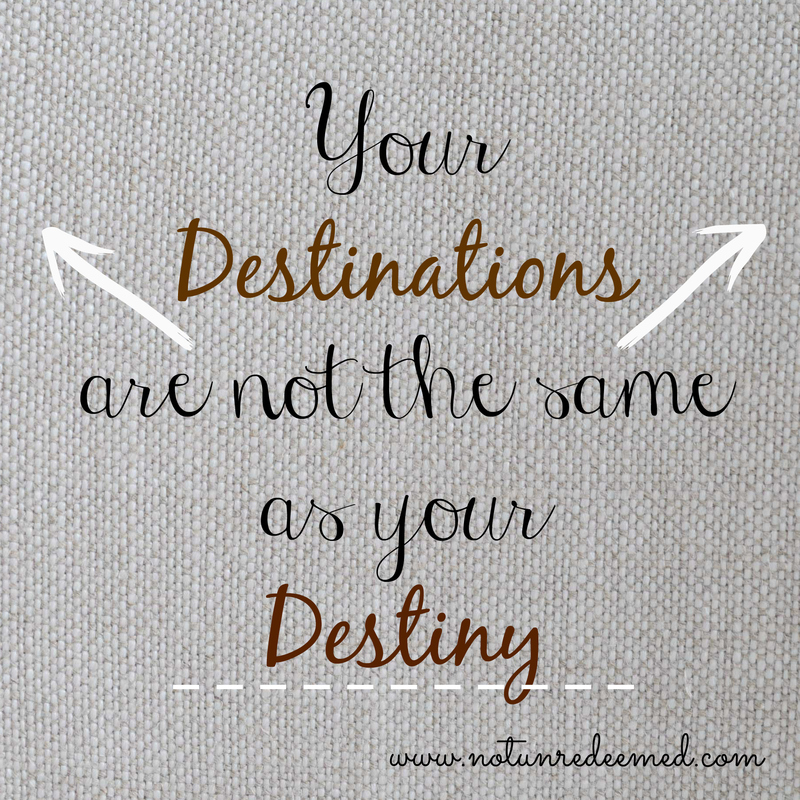 That is your destiny – carry it into your destination! 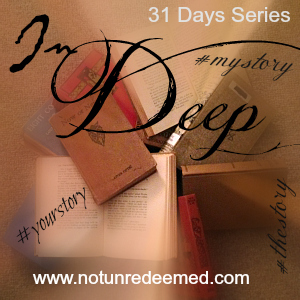 Categories: 31 Days - In Deep, Discipleship, Idenity | Tags: Identity, In Deep - A 31 Days Series | Permalink. 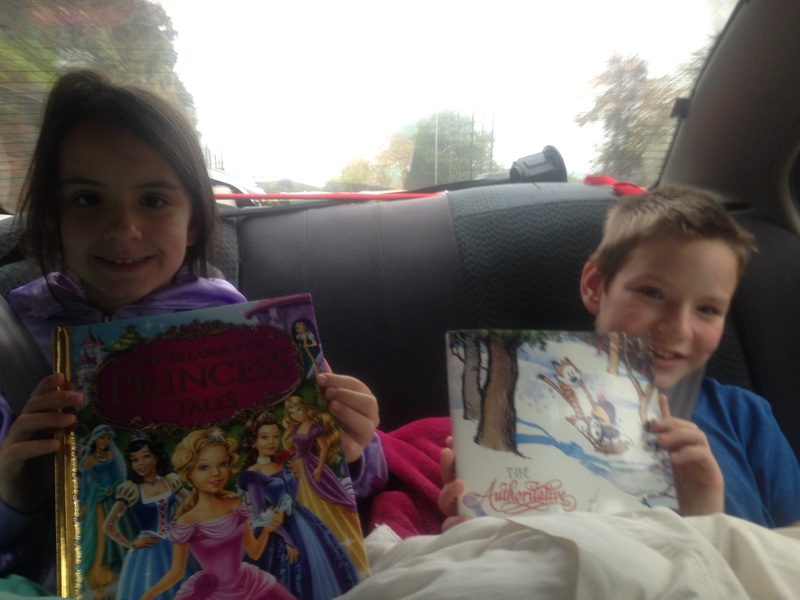 The cuties packed into the back seat of my car. New books, ready to roll! 11 hours here we come! Today my family went from being 130 miles away to 530. Popping home for quick weekend visit, or a younger siblings birthday or graduation party will no longer be an option. Tears well in my eyes as I drive out of state with three of my youngest siblings. We will reunite with the rest of the family, moving vans, and pets sometime tomorrow. Out of my twelve siblings, only two will live in the same state with me. Being the second Mom and very involved in everyone’s life, this move is heartbreaking and freeing at the same time. I hate change ya’ll. Like a lot. Well, that is I used to hate change, now I just make a few faces at it and jump on the roller coaster. I may still squawk some, but you no longer have to forcibly drag me to the roller coaster of change and hold me down. Flashback to August of 2013, a little over a year ago. Tears streamed down my face in the dark concert hall as I listen to Robin Mark sing about change. Why was I even crying? I knew the Lord was preparing me for something, but I didn’t know what. The Spirit sensed what my heart could not. I needed to know I was in His hands to get through this past year. A few short weeks later I had a major job change and that began the process of the Lord stripping me of almost anything that I could put my security or identity in. I went from being a full time youth leader for 6 years in the front lines of ministry to behind a desk as an administrative assistant. Faced major health issues that forced a move from an apt and area I loved. For a season did not lead any small groups, teach any classes or disciple anyone – the Lord removed anything I could possibly “do” for Him as a source of my identity. Watched the man I had prayed and waited for, marry another. Had three of my best friends move out of state, and two more get married. And last but not least, had major turn over at work, with three close friends moving on. I love deeply and passionately and the downfall of that is that I fight the temptation to derive my identity from those I love, and how I love. 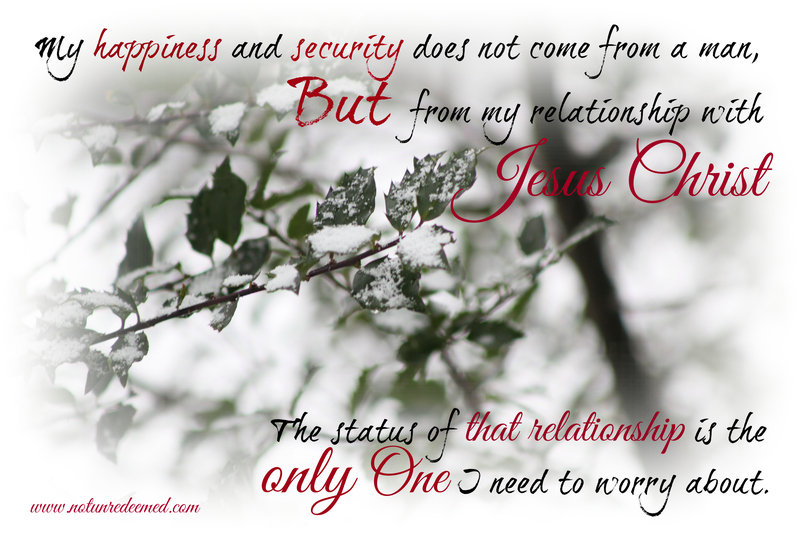 My identity rests only in that which can’t be taken from me – the love of my Father, the pursuit of Jesus, the lover warrior, and the comfort and intimacy of the Holy Spirit. The excruciating process of these changes has left me with a lifeline of truth. The Lord does not change. We may learn about different sides of His face, but He is the constant in the chaos. On the other side of the change He is there. I’m starting to not just see change as something I will loose, but something I will gain. For because of stripping, I’ve come to know Him as the Pearl of great price. Worth anything I can sell, or give. He clothes us now then strips us, Yet with His Word equips us, Whatever is His way all is well, And though our seasons change, We still exalt His name, Whatever is His way all is well. Robin Mark. Listen to the song here. I know not His plans, but I know I am in His hands, and through this last change of the move, I’m looking forward to the more He has for me in it. The hint of the Spirit’s whisper is bringing delight and hope to my soul. All is well. Today’s entry was more of an open journal – a peek into the life of Katie, post. Living fully alive, also means actively engaging with whatever season, circumstance, or situation you are in. Unsure of the vulnerability of this post or how to wrap up, I prayed for inspiration and wisdom. As I got online to upload this post and a friend had tagged me in a music video and said she wasn’t sure why, but she was thinking of me. The time stamp of the post was right around the time I was praying. Friends, the Father knows and hears even our quiet whispered prayers. I am in awe of His love. Please listen to this song below (or watch here). It captures what I have only hinted at here. If you are facing unwanted or uncomfortable change dear one, know His love is big enough to sustain you. When I taste His goodness, I shall not want. “Changes” is a part of the “Today’s The Day: Being Single and Fully Alive” a 31 Days Series. To read more from this series please click here. 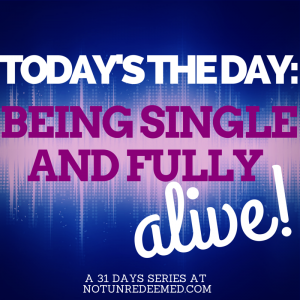 Categories: 31 Days - Today is the Day; Being Single and Fully Alive | Tags: 31 Days of Living Fully Alive, Identity | Permalink. From Victory For Victory – Read Part One Here. We will only win the war against sin when we understand who we are and what sin means to us now that we are His. You see, sin is a bit like a nail. “…as we were walking, I stepped on a board and a nail went through my foot. I lifted my foot and saw that there was a board attached to the bottom of my shoe. I could clearly see that a nail had entered my foot. But never once did I think. “I’m a nail!” I was however very interested in getting the nail out of my foot. And when a child of the light discovers darkness in him or her, it does force the issue: What are you going to do?” (Danny Silk – Culture of Honor) <— Tweet this. 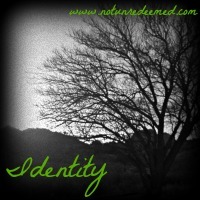 Our fight against sin comes down to our identity in Christ. Knowing and understanding who we are in Christ determines what battle position we start in. Do you start thinking “I’m a nail!” or do you start thinking, “I’m a child of God and He has the power to change me.”? Think about these verses in the context of victory–they depict a beautiful picture displaying part of God’s character. The victory that the Lord has endures forever – it’s complete! We can’t add anything to it or take anything away from it. <— Tweet this. God bought the victory so we would fear Him and understand that He is God and we are not. A humble person is one who sees themselves as God sees them – both as weak and yet strong. In weakness we see His strength. The victory (our position in Christ) already is, has been, and will continue to be. And when sin drives the victory away – God seeks it for us. He renews us! The victory remains, when we walk out of it and drive it away, it still remains. He died to bring it back to us and now reminds us that the victory is already ours! From Victory, For Victory concludes with part 3 – read it here. It’s easy! 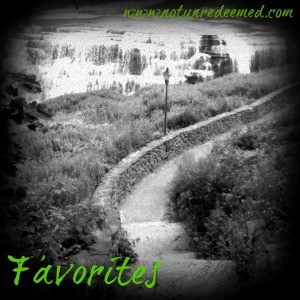 Click on the above link and then enter your email address. Feedburner will automatically send you an confirmation email with an activation link. Click on that link and you’ll be all set! (1) Whose side we are on. (2) What position we fight from. 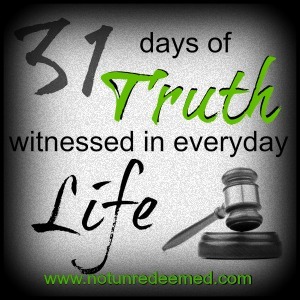 All throughout Scripture, life is defined as a battle. The choice is ours. Christ chose the victory for us – and now invites us to walk in it. 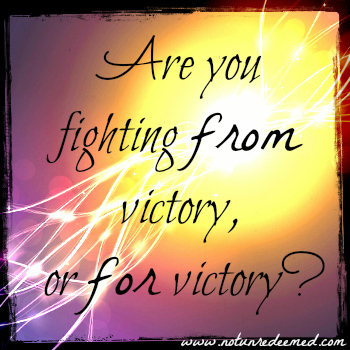 He invites us to fight from a place of victory, rather then always fighting for victory. While the Lord asks us to fight new areas of sin in our lives, what we most often forget is He already won the battle against that sin. His love is stronger then death (Song of Solomon 8), it broke the curse of sin that brought death. He died to FREE us so we could walk in victory. We must fight with the knowledge that only the Lord changes us and the victory is already ours, or we will lose the battle. When we fight against sin from a position of victory we have all the power in the world on our side. When we are simply fighting for victory, we have only the power of our own determination. For a time, our determination may be able to change our behavior; but it does not change our hearts or our emotions (the way we see and feel about things). Only Christ can change those things. In Psalm 51 when David prays “create in me a clean heart Oh God” the Hebrew word for create here is “bara”. It means to create without a physical starting point, with only God as the subject. Essentially what it means is we cannot, in and of ourselves, create a clean heart. When God comes in and creates a clean heart in us, He doesn’t use any of us in the creation of our heart – He uses only Himself. He gives us Himself. 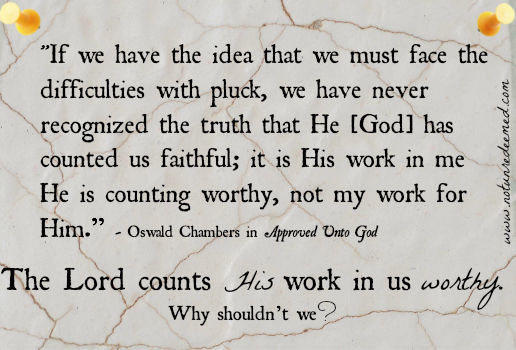 That is why we can fight from victory – because He does the work. Our behavior will always follow our hearts. We must fight for victory in our lives, but in order to do that in Christ’s strength and not our own, we have to start fighting from victory – which is what Christ has done for us. Too often, as Christians, we know the Lord wants us to change and to fight against sin, so we immediately jump to position 2 – fighting for victory. We don’t realize that by missing step 1 – fighting from victory, we are now fighting sin in our own strength – missing the point of what Jesus did for us on the cross. We are told to fight against sin – I’m not saying that fighting from victory means that we don’t fight sin anymore – we do – but how we fight changes. In Hebrews 12:4 we are told to fight even to the point of bloodshed against sin. 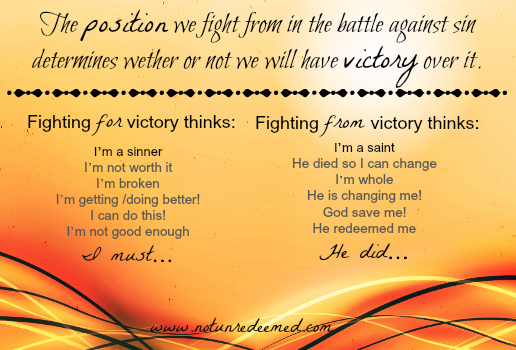 But we can’t effectively fight against sin for victory, until we fight from victory. Fighting from victory means we start fighting from our position in Christ – as sons and daughters of God (John 1:12)- which gives us the position and the power to fight for more victory. If we fight for victory without fighting from victory, we won’t win the battle. It’s only from within our position in Christ that the battle against sin can be won. <—- Tweet this.